Recently I upgraded my ASUS x202e notebook from Windows 8.1 to Windows 10. The upgrade went smoothly and I liked the look of the new OS, but I noticed right away that my touchpad no longer worked. I found some online instructions that restored the cursor, but the click and right-click didn’t work, so what’s the point, right? I contacted ASUS support, and they said I’d need to reinstall the Windows 8 drivers to fix the problem. And since this did fix my problem, I thought I’d post a how-to, as there were several steps. Keep in mind that this is what fixed my problem as of this writing, which is shortly after win10 rolled out. Things may change over the next few weeks and months. OK, so here’s what I did. By the way, you’ll need to have either a touch screen or an external mouse to do this, since there is a fair amount of selecting and clicking, and you don’t have a TouchPad yet! 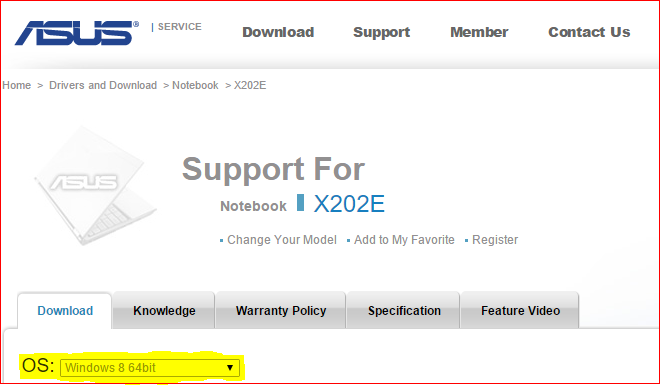 Navigate to http://support.asus.com/download/options.aspx?SLanguage=en , enter your model number, and click ‘Search’. In the page that comes up, click on the link for the model you entered. 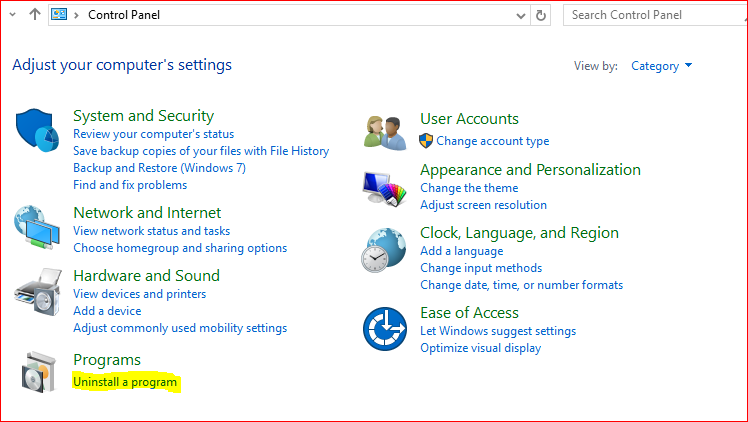 In the page that comes up, select Windows 8 64 bit (not Windows 8.1 64 bit) in the OS drop down. Scroll down to the Touchpad section and expand it. 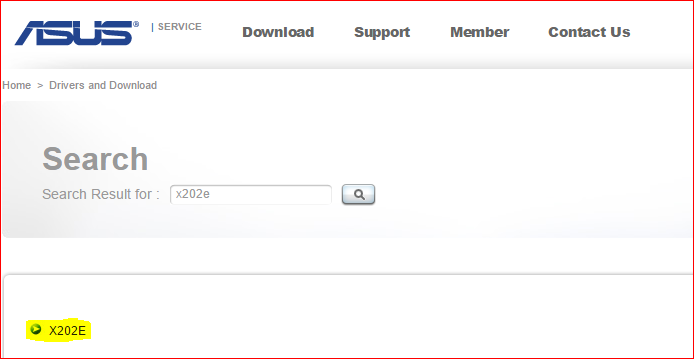 Then, click on the ‘Global’ link in the Version V2.0.1 driver to download a .zip file. 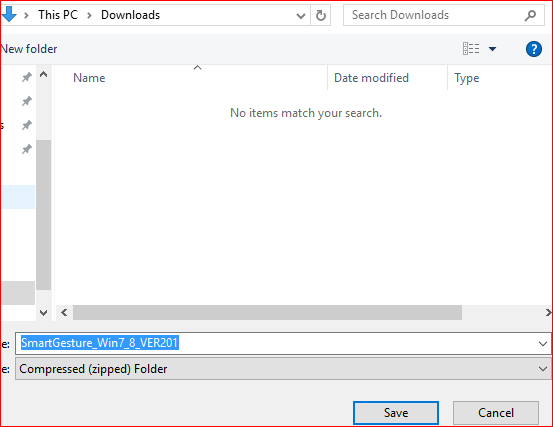 Save the .zip file in the default Downloads folder, or wherever else you want. Just be sure to make a note of where the .zip file is saved so you can find it again. Navigate to the folder where the .zip file is and double click on the file. 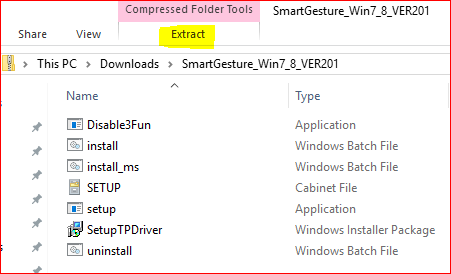 Then, click on ‘Extract –> Extract All’ to extract the contents of the .zip file. Make sure the ‘Show all extracted files when complete’ checkbox is checked. After the new folder opens, make a note of its location because you’ll need to be able to navigate back here again. Now that you’ve downloaded the driver, you’ll need to uninstall the current driver before you can re-install the downloaded one. You should close all your open programs at this point, because the computer will have to do a re-start after it uninstalls the driver. In the ‘Search the web and Windows’ textbox in the lower left of the status bar, type ‘Control Panel’ and then click on the ‘Control Panel Desktop App’. In the Programs section, click on ‘Uninstall a program’. 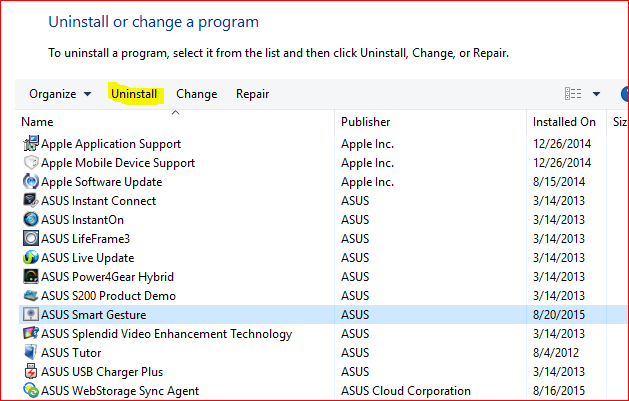 Scroll to ‘ASUS Smart Gesture’, select it, and then click on ‘Uninstall’. Say ‘Yes’ or ‘OK’ or ‘Continue’ to any prompts that come up. When it asks you whether to re-start the computer, say yes. After you’ve logged back in, navigate to the folder you made a note of in step #6 and double-click on it to open it. Double click on the SetupTPDriver Installer file, click on ‘Run’, and then click on ‘Next’ or ‘Yes’ in the following prompts. When it asks you whether to re-start the computer, say yes. I recently ran into a problem in a report I was developing. The report was a Sales Invoice, and if there were enough line items to move the Totals section to a second page, the tablix which contained the totals moved from the right side of the report, where I had set the location, to the middle. Eventually I learned that SSRS attempts to maintain relative spacing between report items, so that if an item to the left of another item changes in size, or is hidden, the item to its right is moved. I had a number of items in my report that had an expression for the Hidden property: ( =iif(Fields!InvoiceType.Value = 2, false, true). I fixed my report by changing the Hidden property for all items to False. Then, to achieve the same effect as hiding, I worked with the Color property: (=iif(Fields!InvoiceType.Value = 2, “Black”,”White”). Changing the font color to white makes it invisible and my Totals tablix stayed where I wanted it, on the right side of the report. Recently I did a presentation on the basic information that users, web developers, and IT people should know about HTML5, and I decided it might be a good idea to post the slides I used in the presentation here. And this works great as long as the columns in our WHERE clause all contain data. However, any column with a NULL value will not be returned. For instance, in the above example we are searching only by Job Number, so any record with a Job Number of 543216 should be returned. But, if the StreetAddress field for any of those records is NULL, then they won’t be returned, even though there is a value of 543216 for the Job Number. Why is this? Because in our WHERE clause we are using the equal operator, and NULL can’t equal anything. NULL isn’t a value – it just means UNKNOWN. So NULL = NULL won’t return true, because what you’re really asking is “Does this unknown thing equal that unknown thing?” And, of course, the answer to that is “Who knows?” It can’t evaluate to true, so it must return false. The solution, then, is to adjust the WHERE clause so that, if the values are NULL, we convert them to something known that we can compare. If we add an ISNULL function to the column side of the equal sign, and add the same replacement value as the final value in the COALESCE function on the other side, as below, then the query should be able to evaluate and return all rows, even ones with NULL values. 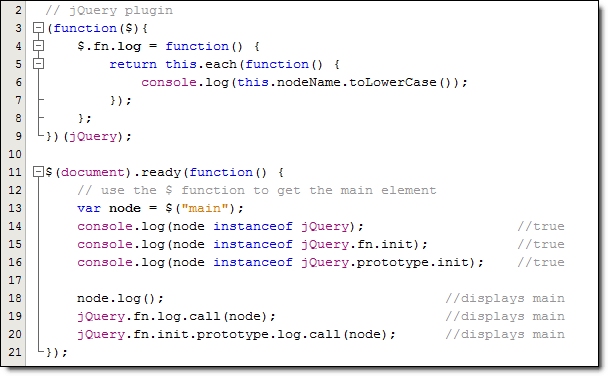 Usually, when you set a control’s Enabled property to False, the control will appear grayed out in the form. However, a DataGridView control whose Enabled property is False looks the same as one whose Enabled property is True. Once you try to click in to the DataGridView to edit or add something, you’ll find that it is not enabled, but it doesn’t look any different – which can be confusing to users, especially if it is on a form with other disabled controls that are grayed out.